The Bioclear dental treatment offers a unique and cutting edge alternative to traditional direct composite restorations. It introduces the use of ‘injection molding’ composite placement techniques with the use of the anatomic Bioclear matrix system. With increasing aesthetic demands from patients the loss of soft tissue particularly in the interdental papilla can be a major concern for patients and can occur due to a number of factors including post non- surgical periodontal therapy or orthodontic treatment. This clinical situation is often termed “black triangle disease”. The Bioclear Method used for black triangles treatment reveals a healthy and youthful smile. Gingival overhangs compromising the periodontal condition. White lines and poor blending with the natural tooth. Early staining of the restoration. These problems have been addressed with the development of the Bioclear composite placement technique used in conjunction with the Bioclear matrix system. Clinically the technique involves the use of specifically anatomically shaped matrices shaped for particular teeth and heated composite which is essentially injection moulded. This is combined with a polishing system that results in highly aesthetic blended anatomically shaped composites, with no overhangs and excellent long term resistance to staining. The Bioclear Method offers a better alternative to other composite restorations. Uneven teeth can be built up with the Bioclear Method to reveal an aesthetically symmetrical smile. The technique was first described in the UK by Morby, Burgess and Hassall in the International Journal of Advanced Clinical Dentistry, the official journal of the British Academy of Aesthetic Restorative and Implant Dentistry (BAARID). Anterior and posterior composite restorations. Direct composite crowns particularly on peg shaped laterals. Claire Burgess BDS MFGDP RCS (Eng) MSc (Res Cos Dent) UCLan is the UK Certified Bioclear instructor and practices embrasure treatments at Smile Concepts. Upon completion of the two days course “Bioclear Method Anterior Composite Course (Level 1 and Level 3)”, delegates will have the opportunity to be Level 1 and Level 3 Bioclear Practitioners. 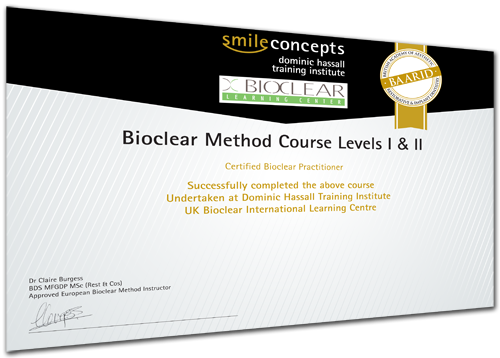 We also offer “Bioclear Method Posterior Composite Course (Level 2 and Level 4)” two days course, therefore delegates who complete this 2 day course will also become Level 2 and Level 4 Bioclear Practitioners. “Brilliant 2 days.” – D. Jairath 16/7/16. “Excellent teacher, Claire has amazing teaching skills and interesting presentations.” – A. Salcianu 22/4/16. “Excellent speaker, I have learnt a lot form the hands-on aspects. Overall very happy with the course.” – B. Mooney 26/2/16. “Great speaker & great course and relevance. Good balance of practical’s.” – C. Dewdney 11/7/15. The Bioclear treatment system provides a highly cost effective and durable treatment option for your patients. We welcome referral of your patients to Smile Concepts for Bioclear dental treatment. You can refer a patient electronically by completing and submitting a referral form, by email, post or by telephoning the practice directly. For more information and to download referral forms, visit “How to Refer a Patient” page.